Port Columbus International Airport (CMH) commonly shortened to Port Columbus, is an international airport located 6 miles east of downtown Columbus. It is managed by the Columbus Regional Airport Authority which also oversees operations at Rickenbacker International Airport and Bolton Field. The airport code 'CMH' stands for "Columbus Municipal Hangar" though that name is no longer used today. 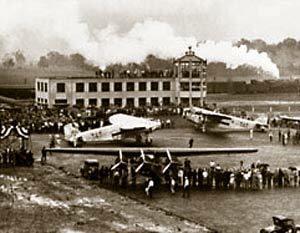 The airport opened in 1929 on a site selected by Charles Lindbergh, as the eastern air terminus of the Transcontinental Air Transport (TAT) air-rail New York to Los Angeles intercontinental route. Port Columbus was a specially built air-rail facility outside Columbus— in fact, it was the only one of its kind in the world. On July 8, 1929, 19 daring people including famed aviatrix Amelia Earhart, who served as Assistant to TAT’s General Manager, made the inaugural westbound trip. After leaving New York City at 7:05 pm by train on July 7, they arrived at Port Columbus Station aboard “The Airway Limited” at 7:55 am the following day. Two Ford Tri-Motors, the “City of Columbus” and the “City of Wichita,” were waiting to take them to Waynoka, Oklahoma where they would transfer to another train for the third leg of their journey. The entire coast-to-coast trip was publicized as taking 48 hours to complete. Following that initial flight, the typical westbound TAT passenger, the trip began at 6:05 P.M. at Pennsylvania Station in New York City, where he boarded the Pennsylvania Railroad’s Airway Limited, a luxury Pullman, for the first leg of the journey across the Alleghenies. The overnight train ride avoided the mountainous regions that veteran air-mail pilots called “Hell Stretch,” where winds were often adverse and the weather subject to sudden change. Plus, there were only a few small air fields like Bellefonte in Pennsylvania where a passenger airplane could land. The only inconvenience to the train ride was the baggage restriction: 30 pounds per passenger. The cost for this cross-country venture was just 16 cents a mile, and, it only beat a cross-country train ride by about 24 hours in total time from New York to Los Angeles. Because of technical problems with the route, the depression, and frequent flight cancellations, TATs service came to be known as "Take A Train." The original terminal building and hangars still exist on the south side of the airport, along 5th Avenue, and are in use and the former terminal has been restored and is used for rental office space, while the original hangars are still used for airport operations. By 1939, Port Columbus was handling a whopping 14 flights per day with 10 of those flights being Transcontinental and Western Airlines (predecessor of Trans World Airlines). Hotels located in the airport grounds include the Comfort Suites (tel: (614) 237 5847 or 800 424 6423 toll free USA and Canada only), Concourse Hotel (tel: 800 541 4574 toll free USA and Canada only), Cross Country Inn (tel: (614) 237 3403 or 800 621 1429 toll free USA and Canada only), Hampton Inn (tel: (614) 235 0717 or 800 426 7866 toll free USA and Canada only) and Hilton Garden Inn Columbus Airport (tel: (614) 414 5000 or 800 445 8667 toll free USA and Canada only). There are courtesy telephones at a hotel information board located near the baggage claim belts for reservations and to request a shuttle service from the airport. 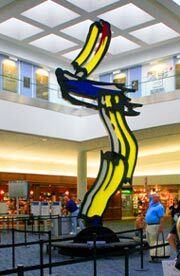 Standing 26' tall at the entranceway to Concourse B, Brushstrokes in Flight is a dynamic example of art in Ohio. Installed at Port Columbus in 1984 and moved to its current location in May of 1998, this beautiful sculpture was designed by the late Roy Lichtenstein (an Ohio State alumnus). Easy to spot, it serves as an excellent meeting place that offers plenty of seating. However, Brush Strokes in Flight didn't always command high praise. It was originally installed outside the airport, but its location was mostly a secret and people just didn't know it was there. In the mid-1980s Mayor Rinehart announced his intention to give the sculpture to the city of Genoa, Italy as a thank you for that city's gift to Columbus: a statue of Christopher Columbus located at City Hall. To the relief of local art fans, it turned out that the mayor didn't have the authority to make that gift, so the artwork stayed at the airport. To see what all the fuss was about, visit the sculpture located near the entrance to Concourse B.